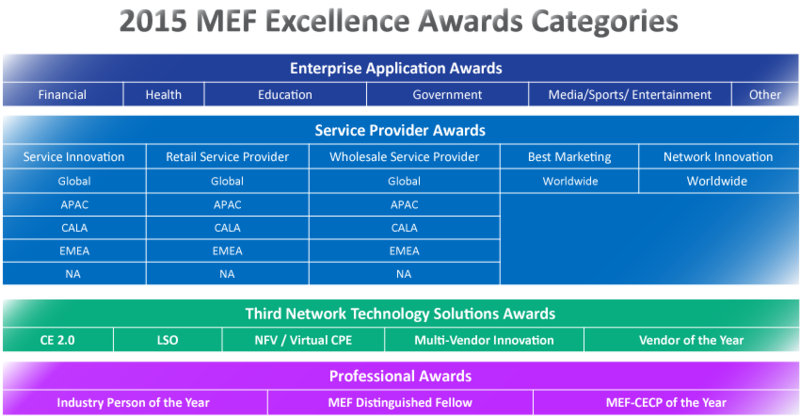 The MEF Excellence Awards program recognizes service, application, technology, and professional excellence and innovation in the global Carrier Ethernet & emerging Third Network community. The annual Awards program is the largest, longest-running in the world focused on Carrier Ethernet services and applications and is among the first in the industry to spotlight leadership in emerging dynamic Third Network services powered by CE 2.0 + LSO (Lifecycle Service Orchestration), NFV, and SDN networking technologies. Winners of the MEF Excellence Awards for 2015 were announced November 17th at the MEF Excellence Awards Gala Dinner as part of GEN15 in Dallas, TX. Congratulations to all of the winners. The Enterprise Application - Education Award recognizes the most innovative use of Carrier Ethernet services to meet the requirements of education-related applications. Application examples include: campus, remote learning, school systems, global and regional research and development initiatives, and industry collaborations. The Enterprise Application - Financial Award recognizes the most innovative use of Carrier Ethernet services to meet the requirements of financial-related applications. Application examples include: commercial banking, investment banking, brokerage, stock exchanges, credit and payment processing, and insurance. The Enterprise Application - Government Award recognizes the most innovative use of Carrier Ethernet services to meet the requirements of government-related applications. Application examples include: national, regional, statewide, county, and municipal. The Enterprise Application - Health Award recognizes the most innovative use of Carrier Ethernet services to meet the requirements of health-related applications. Application examples include: regional hospital networks, imaging, research, biotechnology, health insurance, and health care services. The Enterprise Application - Media/Sports/Entertainment Award recognizes the most innovative use of Carrier Ethernet services to meet the requirements of media, sports, or entertainment-related applications. Application examples include: permanent, series, or one-off events (a world sports event, a moving series of events, etc.) and media applications such as Internet-based programming, preparation, distributing programming, film or CGI development. The Enterprise Application - "Other" Award recognizes the most innovative use of Carrier Ethernet services to meet the requirements of other important applications that do not fit in the above industry vertical categories. Application examples include: IT applications, systems development, manufacturing, retail, mining, etc. The Service Innovation - APAC Award recognizes the most innovative Carrier Ethernet / Third Network connectivity service available in the Asia Pacific region. The Service Innovation - EMEA Award recognizes the most innovative Carrier Ethernet / Third Network connectivity service available in Europe, Middle East, Africa region. The Service Innovation - Global Award recognizes the most innovative Carrier Ethernet / Third Network connectivity service available in two or more geographic regions (APAC, CALA, EMEA, or NA). The Service Innovation - NA Award recognizes the most innovative Carrier Ethernet / Third Network connectivity service available in the North America region. The Retail Service Provider - APAC Award is awarded to the provider who best implements retail Carrier Ethernet 2.0 / Third Network connectivity services in the Asia Pacific region. The Retail Service Provider - CALA Award is awarded to the provider who best implements retail Carrier Ethernet / Third Network connectivity services in the Caribbean & Latin America region. The Retail Service Provider - EMEA Award is awarded to the provider who best implements retail Carrier Ethernet 2.0 / Third Network connectivity services in Europe, Middle East, Africa region. The Retail Service Provider - Global Award is awarded to the provider who best implements retail Carrier Ethernet 2.0 / Third Network connectivity services in two or more geographic regions (APAC, CALA, EMEA, or NA). The Retail Service Provider - NA Award is awarded to the provider who best implements retail Carrier Ethernet 2.0 / Third Network connectivity services in the North America region. The Wholesale Service Provider - APAC Award is awarded to the provider who best implements wholesale Carrier Ethernet 2.0 services in the Asia Pacific region. The Wholesale Service Provider - CALA Award is awarded to the provider who best implements wholesale Carrier Ethernet services in the Caribbean & Latin America region. The Wholesale Service Provider - EMEA Award is awarded to the provider who best implements wholesale Carrier Ethernet 2.0 services in Europe, Middle East, Africa region. The Wholesale Service Provider - Global Award is awarded to the provider who best implements wholesale Carrier Ethernet 2.0 services in two or more geographic regions (APAC, CALA, EMEA, or NA). The Wholesale Service Provider - NA Award is awarded to the provider who best implements wholesale Carrier Ethernet 2.0 services in the North America region. The Best Marketing Award is given to the service provider who has demonstrated outstanding leadership in the marketing of Carrier Ethernet / Third Network connectivity services over the past year. The Network Innovation Award is given to the service provider who has demonstrated outstanding leadership in the development and implementation of a "Third Network" innovation strategy centered on a combination of Carrier Ethernet 2.0, LSO (Lifecycle Service Orchestration), SDN, NFV, or optical networking technologies. The Third Network Technology Solutions - CE 2.0 Award recognizes industry leadership and innovation in a MEF Carrier Ethernet 2.0 certified-based technology solution. This award may be given for a single product or a set of CE 2.0-certified platforms that may include value-added feature sets/capabilities (for example, integrated NFV functionality). The Third Network Technology Solutions - LSO Award recognizes industry leadership and innovation with regard to a Lifecycle Service Orchestration (LSO) technology solution. LSO solutions include a set of capabilities designed to streamline and automate the network service lifecycle in a sustainable fashion. This includes such features as fulfillment, control, performance, assurance, security, usage, analytics, and policy. The Third Network Technology Solutions - Multi-Vendor Innovation Award recognizes two or more companies for industry leadership and innovation in providing a comprehensive network technology solution set that supports the delivery of more agile, assured, and orchestrated services over more automated networks. This solution set may include a combination of CE 2.0, LSO, SDN, NFV, and/or optical networking technologies. The Third Network Technology Solutions – NFV-Based Virtual CPE Award recognizes industry leadership and innovation with regard to a Virtual CPE solution based on Network Functions Virtualization technology. This is one of the most popular use cases for NFV technology. The Third Network Technology Solutions - Vendor of the Year Award recognizes industry leadership and innovation in providing a comprehensive network technology solutions portfolio that supports the delivery of more agile, assured, and orchestrated services over more automated networks. This portfolio should include a combination of CE 2.0, LSO, SDN, NFV, and/or optical networking technologies. The Industry Person of the Year Award is given to an individual who has exhibited professional excellence and made outstanding contributions to the advancement of the Carrier Ethernet & emerging Third Network services & technology ecosystem. MEF Carrier Ethernet Certified Professional of the Year will be awarded to the MEF-CECP who has shown leadership in the expansion of Carrier Ethernet around the world or has provided the most outstanding technical contribution to the Carrier Ethernet Technical Community. Recognize the most innovative use of Carrier Ethernet services to meet application requirements of particular industry verticals, including finance, health, education, government, media, sports/entertainment, and other sectors. Recognize leadership in the development and delivery of global, regional, retail, and wholesale services as well as excellence in Carrier Ethernet / Third Network service innovation, marketing, and network modernization. Recognize leadership in CE 2.0, Third Network, LSO, NFV-based Virtual CPE, and multi-vendor technology solutions. During the Awards Dinner, the MEF will also recognize individuals who exhibited professional excellence and advanced the work of the MEF and the development of Third Network solutions. The three Awards in these categories include Industry Person of the Year, MEF Distinguished Fellow, and the MEF Carrier Ethernet Certified Professional (MEF-CECP) of the Year. The prestigious MEF Excellence Awards program recognizes service, application, technology, and professional excellence and innovation in the global Carrier Ethernet & emerging Third Network community. The annual Awards program is the largest, longest-running in the world focused on Carrier Ethernet services and applications and is among the first in the industry to spotlight leadership in emerging dynamic Third Network services powered by CE 2.0 + LSO (Lifecycle Service Orchestration), NFV, and SDN networking technologies. The 2014 Awards program was the biggest ever held by the MEF, with more than 150 submissions received from nearly 50 companies who competed for 29 awards. Building on this momentum, we have expanded the 2015 Awards program to include 31 awards in four major categories. Enterprise Application Awards - jointly awarded to a service end-user and their service provider, these awards recognize the most innovative use of Carrier Ethernet services to meet application requirements of particular industry verticals. Service Provider Awards - recognizes leadership in the development and delivery of global, regional, retail, and wholesale services as well as excellence in service innovation, marketing, and network modernization. Third Network Technology Awards - recognizes leadership in CE 2.0, LSO, NFV, Third Network, and multi-vendor technology solutions. Professional Awards - recognizes individuals who exhibited professional excellence and advanced the work of the MEF and the development of Third Network solutions. The 2015 Awards for each category will be presented on 17 November at the MEF Excellence Awards Gala Dinner as part of GEN15 in Dallas, TX. More than 300 people attended last year's ceremony, and the feedback received was overwhelmingly positive. To view last year's program and the Awards dinner, please visit the MEF public web site. To register for this year's dinner, please click here.